Georgia can’t play basketball. Their football team has been mediocre to terrible in the super-tough SEC. However, there’s one claim the Georgia Bulldogs can make: they’re the national champions of partying. For the first time ever, the University of Georgia has been named America’s top party school by the Princeton Review. UGA has made the list 10 times since 1992, but this is the first time they’ve ever topped the list. If that’s not a reason to start drinking on a Tuesday morning, I’ve never heard one! The Dogs beat out perennial favorites like the University of Florida, Penn State University, West Virginia, and second-place Ohio University thanks to the city of Athens and its 100 bars near campus. 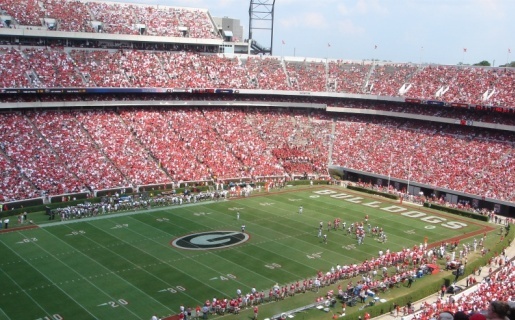 Binge drinking is a college tradition at Georgia, alongside UGA the dog and getting your stomach pumped. Meanwhile, on the other side of the scale, Brigham Young University tops the list of Stone Cold Sober schools for the incredible 12th year in a row! Hoist a ginger ale and celebrate your sobriety, BYU Cougars! But don’t tarry too long, you need to get back to work because idle hands are the Devil’s plaything.